Sutria “Cucut” Syati (YES Indonesia 2011-2012) competing in National Science Bowl with Wilson High School team; Washington DC, April 29, 2012. For Kennedy-Lugar Youth Exchange and Study (YES) student Sutria "Cucut" Syati of Indonesia, competing in the National Science Bowl in Washington, DC, was inspiring, eye-opening, exciting, fun, and possibly even life-changing. Her Wilson High School team, the Washington, D.C. regional champions, found itself in a swirl of breathtaking talent among the 68 other teams from around the nation. Cucut was inspired by meeting so many students who loved science and math but were also funny, sociable, multi-talented – the opposite of what she had expected. She was a little shocked by how much her competitors knew and how quickly they solved problems in math and science. She went into the first eight round-robin contests nervous but put her team on the scoreboard first and, as the rounds progressed continued to score more and more points for her team. Although Wilson High didn't make the cut for the final 16 teams, Cucut came away with new friends and a new commitment to being her best. Afterwards she said, "It's like a trigger. It's changed me a lot. It made me realize that to be great you have to put in more effort. There are no instant things in the world ... except ramen noodles!" 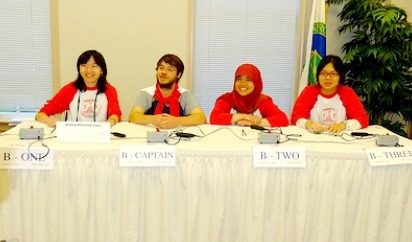 "I observed a lot in the National Science Bowl," reflects Cucut. "And I know now why the USA is more advanced in many things...because they have many great people – not one or two but many! America gives freedom to people all nationalities. That's why I think America is a really good place to have a career for these people who are really willing to do well." Reflecting on being the only exchange student there, she said, "Not all American kids can feel what I feel, to be part of this. Really to be an exchange student here is not only to have fun – you should learn something. Traveling is really fun but there are a lot more important things that you should dig out about America."